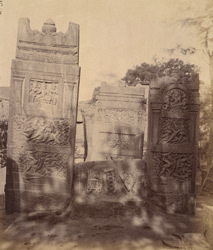 Photograph of some viragals, Betgeri taken by Henry Cousens in the 1880s. Viragals or memorial stones are slabs of stone decorated with bands of sculpture with inscribed bands between. The sculptures and the inscriptions represent scenes related to the hero to whom the slab has been erected. The lowest band represents a battle scene in which the hero is depicted as a giant. The next band shows him being carried to paradise after his death. The top panel contains different objects of worship. The inscriptions record the death of the hero. One of the largest groups of these stones is found in Betgeri, Dharwar district.